Microchip announces the new PolarFire™ FPGA imaging and video solution to address the challenges of developing complex computer algorithms which enable systems to capture and display information and high-resolution images. The PolarFire™ FPGA imaging and video solution delivers capabilities superior to alternative technologies to support resolution as high as 4K in small, low-power form factors necessary for a wide variety of imaging and video applications. As designers require high-performance computing, memory and connectivity resources to achieve high-resolution imaging with rich, vivid detail, Field Programmable Gate Arrays (FPGAs) are excellent platforms to achieve this, as they can perform thousands of tasks in parallel to maximise data throughput. Microchip’s award-winning PolarFire FPGAs, originally launched in February 2017 by Microsemi Corporation, now a wholly owned subsidiary of Microchip, are ideal for these mid-bandwidth (4K/2K) imaging/video applications due to their rich memory and Digital Signal Processor (DSP) resources. In addition, they offer up to 50 percent lower power than competing Static Random-Access Memory (SRAM)-based devices. The new imaging and video solution includes a complete ecosystem for customers, with comprehensive application-specific hardware, optimised intellectual property suite for image processing, sample reference designs, demonstration designs and collateral. This provides designers with the hardware and software needed to implement 4K resolution designs targeting PolarFire FPGAs. The video and imaging kit enables high-performance evaluation of 4K image processing and rendering using dual-camera sensors suitable for designing demonstrations for video stitching, static and dynamic object insertion, as well as real depth estimation based on disparity maps. With its modular intellectual property suite providing clients the ability to prototype and accelerate time to market, the kit can be leveraged for multiple projects to save costs, time and effort. The kit also includes industry-standard imaging interfaces bolstered by 4 GB on-chip Double Data Rate fourth-generation (DDR4) and 1 GB flash memory for frame buffering and user configuration, respectively. It offers bidirectional Mobile Industry Processor Interface (MIPI) as a sensor interface and the choice of High-Definition Multimedia Interface (HDMI), Display Serial Interface (DSI) for display and Serial Digital Interface (SDI) for broadcast-grade video. The kit also facilitates the evaluation of reference designs for Picture-in-Picture (PiP) and edge detection with configurable resolution and image signal parameters. These features enhance the PolarFire FPGA imaging and video solution’s suitability for numerous applications in multiple markets, including surveillance and Internet Protocol (IP) cameras, automotive and other untethered/mobile use cases, machine vision/medical, smart home and others in the industrial, aerospace/aviation and defence markets. To learn more about Microchip’s cost-optimised PolarFire FPGAs, delivering the industry’s lowest power at mid-range densities with exceptional security and reliability, visit www.microsemi.com/polarfire. The PolarFire imaging and video solution includes dedicated hardware to enable evaluation of multiple imaging and video protocols on PolarFire FPGAs. The development kit, optimised intellectual property suite, sample reference designs, demonstration designs and collateral are also included as part of the solution’s complete ecosystem. The kit includes a free one-year gold licence to the Libero® SoC Design Suite, Microchip’s comprehensive development tool. 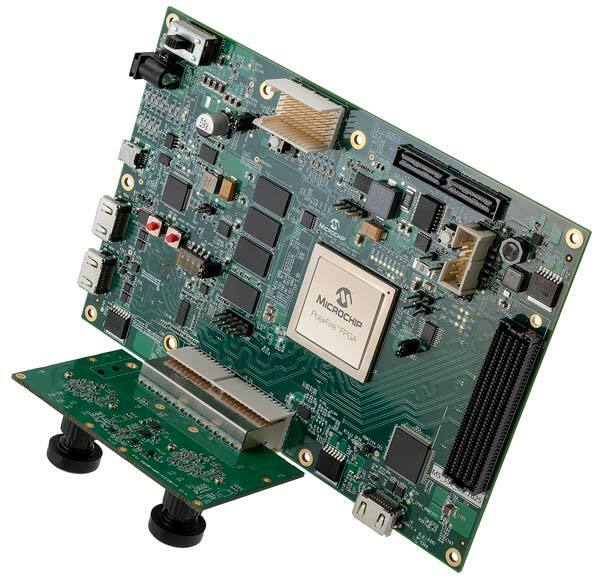 Microchip’s PolarFire FPGA imaging and video kit, MPF300-VIDEO-KIT, is available for purchase now.